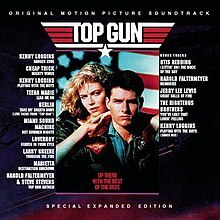 Top Gun is the soundtrack from the film of the same name, released in 1986 by Columbia Records. In 1999, it was reissued in a Special Expanded Edition with additional songs. In 2006, it was reissued again in a Deluxe Edition with yet more songs. The album reached number one in the US charts for five nonconsecutive weeks in the summer and autumn of 1986. It was the best selling soundtrack of 1986 and one of the best selling of all time. According to Allmusic.com,. the album "remains a quintessential artifact of the mid-'80s" and the album's hits "still define the bombastic, melodramatic sound that dominated the pop charts of the era." The song "Take My Breath Away" by Berlin went on to win the Academy Award for Best Original Song, and the Golden Globe Award for Best Original Song. The original version released in 1986 included 10 tracks. Tracks 11 to 15 are available on a Special Expanded Edition released in 1999. Tracks 16 to 20 are available on a Deluxe Edition released in 2006. Tracks 16-20 do not appear in the film, nor are they related to it in any way. The song "Through the Fire" can only barely be heard playing on the radio in the locker room scene that takes place after the first hop. Toto were originally intended to perform the track "Danger Zone" but legal conflicts between the film's producers and the band's lawyers prevented this. Members of Toto also wrote and intended to perform a track called "Only You" that would have been used as the love theme instead of "Take My Breath Away," but the legal conflicts prevented any use of "Only You." Bryan Adams was approached to allow his song "Only the Strong Survive" on the soundtrack and perform the track "Danger Zone". But Adams refused any involvement, feeling that the film glorified war and he did not want any of his work linked to it. REO Speedwagon were also approached to perform "Danger Zone," but the group declined due to not being allowed to contribute any of their own compositions to the soundtrack. Corey Hart was also approached to perform "Danger Zone," but he declined, preferring to write and perform his own compositions. Hart, however, would later record a song he did not write, "Hold On," for the soundtrack to Beverly Hills Cop II. Eventually, the film producers agreed that "Danger Zone" would be recorded and performed by Kenny Loggins. Judas Priest were also approached to allow their song "Reckless" on the soundtrack, but declined, both because they thought the film would flop and because it would have meant leaving the song off their 1986 album Turbo. The Motels were originally considered for "Take My Breath Away." A demo version exists on their compilation, Anthologyland. The Cars song "Stranger Eyes" (from their 1984 album Heartbeat City) was featured in an early teaser trailer, though it was absent from the final cut of the film. Bobby Blotzer of Ratt proposed using the song "Reach for the Sky", an outtake from Ratt's 1984 album Out of the Cellar. Though the rest of the band seriously considered the idea, they declined under the beliefs their long-time fans would not like the song and would accuse the group of selling out. Though the song title "Reach For The Sky" would become the title of a 1988 album, the track itself was never officially released. Ratt would, however, later contribute "Body Talk" from Dancing Undercover to the soundtrack for The Golden Child. ^ Denisoff, R. Serge; Romanowski, William D. (2011-12-31). Risky Business: Rock in Film. Transaction Publishers. ISBN 9781412833370. ^ a b "Top Gun [Original Motion Picture Soundtrack] - Original Soundtrack | Songs, Reviews, Credits | AllMusic". AllMusic. Retrieved 2017-05-19. ^ "The 59th Academy Awards | 1987". Oscars.org | Academy of Motion Picture Arts and Sciences. Retrieved 2018-03-03. ^ "Winners & Nominees 1987". www.goldenglobes.com. Retrieved 2018-03-03. ^ a b "Official TOTO Website - Encyclopedia". www.toto99.com. 2007-04-29. Retrieved 2012-03-12. ^ Blotzer, Bobby (2010), Tales of a RATT: Things You Shouldn't Know, Blotzer Brothers Publishing, ISBN 9780615364018. ^ "Canadian album certifications – Various Artists – Top Gun - Original Motion Picture Soundtrack". Music Canada. ^ "Les Albums Double Platine :" (in French). Infodisc.fr. Archived from the original on 19 November 2015. Retrieved 3 May 2012. ^ "French album certifications – Original Soundtrack – Top Gun - OST" (in French). InfoDisc. Select ORIGINAL SOUNDTRACK and click OK.
^ "Gold-/Platin-Datenbank (O.S.T. - Various; 'Top Gun')" (in German). Bundesverband Musikindustrie. ^ "Japanese album certifications – Various – Top Gun" (in Japanese). Recording Industry Association of Japan. ^ "IFPIHK Gold Disc Award − 1988". IFPI Hong Kong. ^ "British album certifications – Original Soundtrack – Top Gun - OST". British Phonographic Industry. Select albums in the Format field. Select Platinum in the Certification field. Type Top Gun - OST in the "Search BPI Awards" field and then press Enter. ^ "American album certifications – Soundtrack – Top Gun". Recording Industry Association of America. If necessary, click Advanced, then click Format, then select Album, then click SEARCH.